Are you drinking your calories? 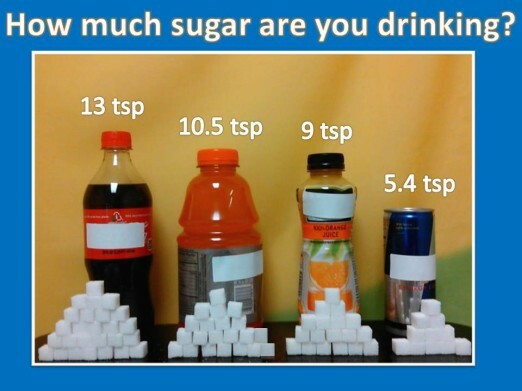 Many people don’t realize how much sugar and calories are in drinks. Drinks can easily add up to 1,000 calories a day which can cause us to gain weight. Soda, sport drinks, sweet tea, and even fruit juices all have sugar. One 20-ounce bottle of soda can add 240 calories and 13 teaspoons of sugar to your diet. Sports drinks, which are often marketed as healthy drinks, pack a lot of sugar with about 10 ½ teaspoons of sugar and 200 calories in a 32-ounce bottle. Fruit juices, even the 100% juice, have a lot of sugar. A 15.4-ounce bottle of Minute Maid orange juice has 9 teaspoons of sugar and 220 calories. Check the nutrition label before you drink! Even if you think you are choosing a healthy drink, you may be surprised by the sugar and calories in your favorite beverages. Always check the nutrition label! Avoid sports drinks and energy drinks. Skip pre-sweetened coffees and teas. If you are going to indulge in a sugary beverage, choose a smaller size. Drink more water! If you don’t like the taste of water, there are plenty of options for adding flavor. Try low calorie flavor packets or add lemon or lime slices to your water.